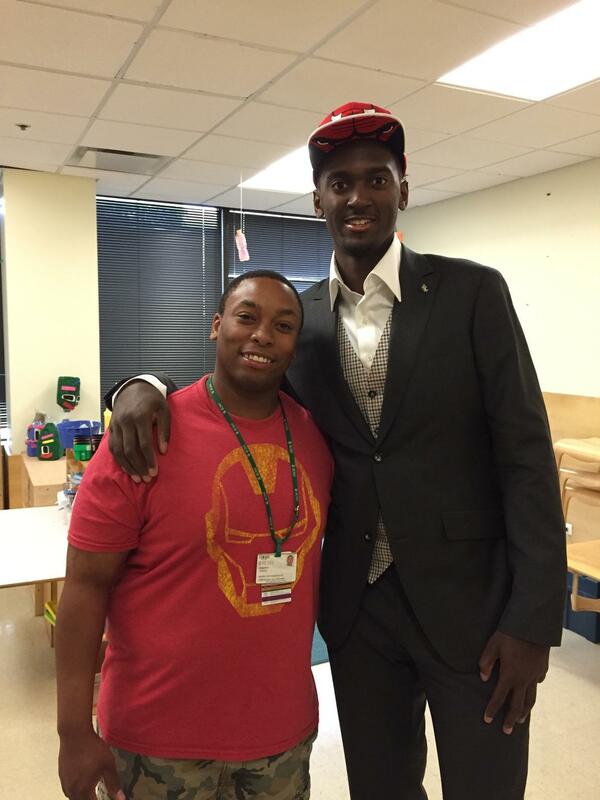 Take a look at the man himself, newest Bulls draft pick Bobby Portis, as he gets familiar with Regal Radio co-founder (and host of Champ’s Rundown, WARR’s first video series) Joe “Champ” Tanksley at the Laurance Armour Day School on Chicago’s West Side on Monday. We can’t promise an exclusive with the young baller (*yet*) but know that he’s down with the squad and we’re down with him, he didn’t even have to bring us donuts. One thing Portis is known for is hustle, that would make him a natural companion of our guy Brandon Robinson in NYC. As expected, Scoop B was at the NBA Draft last week where Portis heard his name called as a Bull for the first time and they bonded, as Portis is known to do, over some good ol’ Chicago fast food. Hopefully Portis will hang out with the crew some more and we’ll offer the first six-piece on us. Only the first though, especially if its after his contract signing.